Review: What if the only person you could trust is the person who is trying to kill your friend? That is exactly what Proxy by Alex London is about. Sydney is a proxy to one of the most well known accountant's son, Knox, who is the patron of Sydney. Everything that Knox does wrong or bad, and the punishment is then forced upon Sydney. So when Knox gets into a car crash with a girl named Marie, all debts are over and it's a life for a lifeÉ Or is it? Marie is a "cause girl" which means that she is fighting for a cause. That cause is to change the whole proxy/patron system into something where everyone is equal. This is an unbelievably dangerous task to change what everyone knows to be true. Eventually, they realize that Sydney is the key to ending the social system that they know. They also figure out the key is in his blood, but Sydney isn't the only person with the blood running through his veins. One of them must dieÉ who is the other person that holds the key to changing the system? And who will die to change the lives of everyone else? Proxy by Alex London is honestly one of the most inspiring and amazing books I have ever read. While taking place in a confusing, technological futuristic time, London captivates really ties everything together at the end, ending with a suspenseful and fortifying ending that no one would have expected. Although everyone would enjoy the story line, the language and central plot is best suited to middle school readers and above. London captivates readers with the conflict of "good v. evil" and the enticing topic of a dystopian futuristic life involving technology combined with the past and of what happens today, slavery. While incorporating the often problems found in poverty and the privileges of living in the upper city part of state, I found myself imagining a city like Los Angeles. I often found myself comparing the life of the past, present, and what the future might be like. London keeps you guessing and you don't completely get the answer until the end, which then brings up more questions, so this makes you literally unable to put the book down. Through all the happiness, desperation, and tears I had, I regret nothing. Proxy really makes you not take things for granted and appreciate the way life is now, also making you want to take good care of the future to make sure the world never has to go through the things that Sydney, Marie, and Knox have to go through everyday. I give Proxy 5 stars and two thumbs hoping Proxy will fly off of shelves in June of 2013. We would like to thank Random House for providing a copy of Proxy for this review. 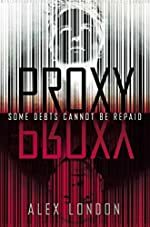 Have you read Proxy? How would you rate it?